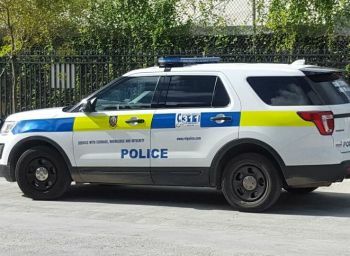 ROAD TOWN, Tortola, VI- A woman from the Dominican Republic who served time at Her Majesty’s Prison in Balsum Ghut between July 2010 and March 2011 for entering the territory illegally and failing to declare money, has accused the Royal Virgin Islands Police Force (RVIPF) of stealing monies from her. According to Denisse Del Sosa Ventura, police had seized two suitcases, $30, 000 that was in a closet and another $6,800 that was in her purse when she was arrested on July 4, 2010 at a home in Great Mountain. Following her release from prison in March 2011following a successful appeal by her lawyer Mary Lou Creque, according to Ms Sosa Ventura, her suitcases were returned to her, however, no cash was returned. It was noted too that police did not document in their report the money that was taken from her purse. “All the items and cash were taken from me by the police officer whom I describe as a dark skinned man, 5’7 tall, slightly overweight. Subsequently I realised that he did not report the cash he took from my purse,” Sosa Ventura had stated in a signed affidavit in 2014, of which a copy was made available to this news site. The woman, who contacted Virgin Islands News Online from an undisclosed location, said she has since been making attempts to recover her money to no avail. “That money [$30,000] was used as evidence and they did charge me for not declaring money, however, I remember an official told me that it was impossible to get that money… so they told me I could get the $6,800,” Ms Sosa Ventura told this news site. The woman further said police over a year ago told her they were investigating the matter and the police accused of taking the money, however, she is yet to receive word on any progress of the investigations. Police also told this news site that investigations are ongoing into Ms Sosa Ventura’s claims. 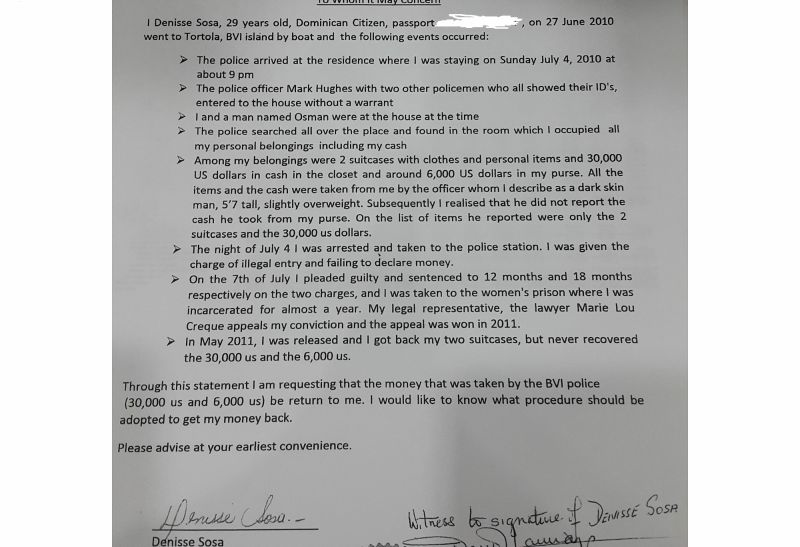 “In relation to the $6,800, we are aware of ongoing investigations into monies which she stated were in her purse,” Police Information Officer, Diane Drayton told this news site on August 9, 2016. Drayton also said the $32, 675 seized from Sosa Ventura was lawfully claimed by the Crown in 2011. “In relation to your inquiry, $32,675 was seized from the individual…on July 5, 2010. In a decision of the court in 2011, those funds were forfeited to the Crown,” Drayton said. Sosa Ventura believes, however, that money should also be returned to her. The woman said she continues to seek legal advice on the matter. so who cares who you believe. Nothing smells worst than a rotten cop. Who were the arresting officers? 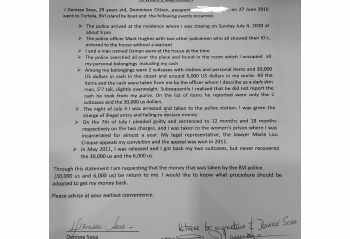 Proactive team, the hustlers, check the sarge he got 6800.
but her letter is dated before the police were arrested. Her letter was dated before their arrest and whilst investigations were on-going but funny enough the United Kingdom supreme white Officers of the investigation team which were so "professional" and thorough in their investigations charged these corrupt officers yet; they did not see it fit to charge the officers for your alleged report of missing monies. I am no rocket scientist or investigator but in the three officers none are that short 5.7 or that fat, they could not have gotten shorter five years later. So a 5.7 ft police officer found this $6800 in your purse he was a bit chubby, or slightly overweight in your quoted words, so low and behold three officers gets charged, called corrupt, and played in the public domain to be tried before their trial, so let's forget my previous description and let's just says it's one of the three officers. The public will be quick to agree and find them guilty because they are already under the microscope....bloggers will believe the story no matter what and their so called colleagues will believe. But J.A they could of lost weight. She need to see their pictures. Maybe she looking at De other Cop this thing more than three. Pin the tail on a donkey 5.7 slightly over weight means u looking at a fat police or chubby of the three police officers which can be described as chubby or slightly over weight and looking at all three the shortest one amongst is about 5.11. Not because three officers in problems you are going to pin it on them come on now. Do some investigations. She was saying that before the officers were arrested. We were living in prison together and we spoke everyday. She is consistent with the amount and her story! You who are defending eating from the money. Plus she promised me some of it, so I want them to give it back to her so I could get my share. This been happening for a long time, and they extort money from people. But when you going prison and going get deported they know that you wont have a say and thief the money. There are cops out there that take pay offs its been happening for years, it will only get worse cause you all gone and hire a set of Jamaican Police who just trying to get their hands on money. The court is another problem, files disappearing and stuff on files missing and clerks getting paid too. Ayo talk that. All this was done under Reynell Fraser watch! That's why he wanted background checks on them. @ I from here...remember a set of them shows up to this territory with forged documents....a few years back one young man was working at the port and used his brother's documents to secure that job.....persons entering the territory should be finger printed like when you enter down town st thomas....understand this; having a set of criminals in charge of your national security is a signal that our leaders is very poor...who vex vex!!! Where is the police chief? Vacation already? @ Hmmmm: the other one should have been investigated as well and charge for neglect of his duty....if the small craft have the ability to engage in this level of mistrust one can only imagine what the higher ups could be doing(poor black brother will always become the fall guy)....just saying and have no problem saying so because who was supervising these guys ???? Is he 5'7 black and overweight? Stupes. I know several more who fit that description but its not any of the three who in things now. Question, only 3 police were working in that department? So everything going get blamed on them? Who was the Inspector? Who was the Chief Inspector? Who counted the money? Who else were on duty? Customs? Immigration? I would like to know how in the hell these events can happen without ALL the higher ups not having a clue! That's the best of some of you, just wait for a negative article to appear on line to come and blogged all the negatives and show all the hatred for the lawmen. Once is a story about police them you will see all the hatred for them. Come on people, irrespective of how bad some of them are, they are the ones who protect us on a daily basis, they are human and make mistakes just like any of us. There are always two sides to a story. That woman came in here not through a proper channel, but was later found with over $30,000 could not give any viable explanation of how she come by the money, automatically the crown can argue that she has proceeds of criminal conduct and then that money will be forfeited to the crown, so what money she wants back. Stop the hating on the police them. @ natty dread....what!!! natty dread here defending dirty babylon; here we have a set of persons who took an oath to execute the laws of this territory that are accused of wrong doing and the natty dread defending...natty dread,we are not talking about one isolated incident these beast boys confiscated dope and money from others as well then intentionally converted those proceeds for their own personal gain: here is the issue; the same laws they swore to uphold are the laws they breaking....there is no special law in this BVI for police, the laws are applicable for one and all of us: as a police while on duty and you have reason to confiscate anything there are set procedure that should be adhered to(does items must go into the police lockup/evidence room) that is the laws of this land: taking that evidence is wrong or violating any of the police procedures is also wrong: any which way to want to twist and turn the matter it is wrong.....the laws of this territory are for the thief also the police!!!!! Fools don't keep their money for long. I believe her but she is a fool. U have that kind of money in your House. It only cost $1,000.00 to install a home video camera. She ought to know that's the kind of money people will Rob u and kill u for. People with that kind of money in your house please get home security cameras hooked up. I wasnt debating nothing with them dudes, they could of kept the money I was returning for something else.